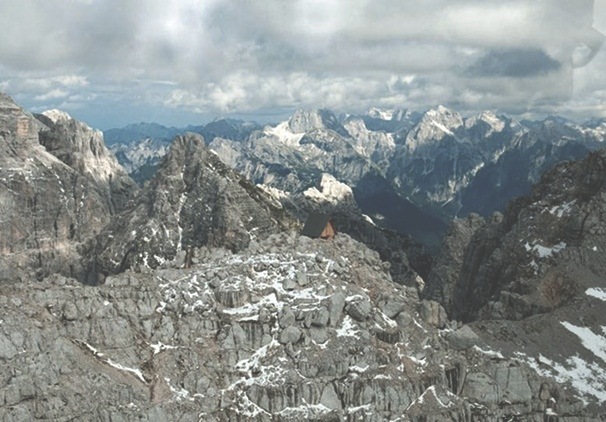 Graduating from the University of Trieste in June 2012, by September Giovanni Pesamosca had designed and built this alpine cabin. Twelve volunteers, professionals and family members helped construct the cabin in just one day, using prefabricated parts lifted up to the 2,531m height. The 15m squared cabin can supposedly house eight hikers in its all-wood interior, protected from the snow by a steep-angled metal roof. The views of the Alps in Friuli are breathtaking, visible through two small windows at either end of the cabin.